I don’t think Beaver Creek could have come up with a more perfect slogan. Rusty and I had the opportunity to head up there for a few days of R&R. Well, sorta. 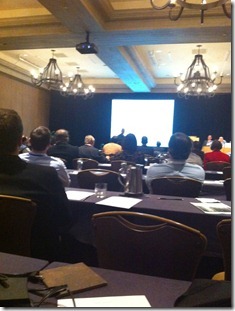 Rusty got to present at the Venture Capital in the Rockies conference, while I got some R&R in the hotel room. While he was at the conference, I spent the day reading, napping, and vegging out in front of the TV. I did peel myself away from my bed and go watch Rusty give his presentation. It was so fun to actually hear the “real live” version! I have spent the last two years listening to him practice and perfect his presentation. He did such a good job. I was really proud! One of his investors came up after and jokingly said, “You did such a great job it brought tears to my eyes!” Then I got to meet many of the people I’ve been hearing about since the beginning of BlogFrog—investors, mentors and friends. It is so nice to be able to have a face to put to all the names. We got to attend a fabulous dinner at the Saddle Ridge Restaurant, compliments of HRO, and then take a dip in one of the 5 hot tubs at the Park Hyatt. 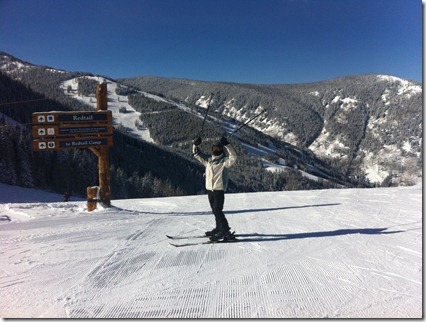 The next day was spent skiing at Beaver Creek, which is one of the most beautiful resorts I have ever been to! The runs were HUGE, and the scenery was breathtaking. 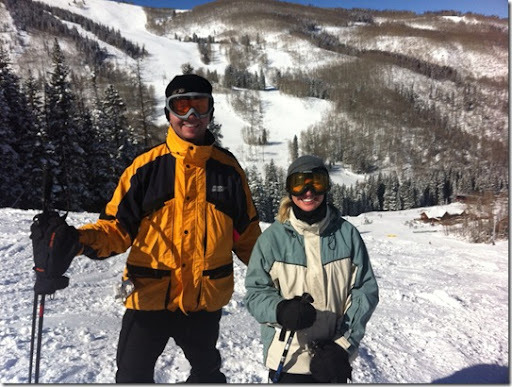 I thought I was a pretty good skier until I got on the slopes with Rusty—He DUSTED me every time. I was exhausted by the end of the day! It was so fun to spend an entire day with each other, uninterrupted by the pitter patter of sweet tiny feet. A HUGE thanks to my amazing, wonderful, friend Jen who watched the kids for us. February 17, 2011 in Uncategorized. Sweet. Beaver Creek is awesome. We had a chance to stay there a few years ago (on the company dime) and it was “not exactly roughing it” for us as well. Glad you could get away. Well that is the cutest picture of you two! I am so glad you had a great time and please drop those kiddos off at my house anytime. THEY WERE AWESOME. I didn't realize you went to Beaver Creek. We spent our honeymoon there after we eloped! And then went back ten years later with four kids! It's my favorite place – I like how it's snug in the mountains and not on the side of an interstate.